When we arrived in Zambia, Africa last week and drove from Livingstone to Victoria Falls, we entered a unique corridor. You cross both passport control out of Zambia and into Zimbabwe. It’s like a Wild West entry point. 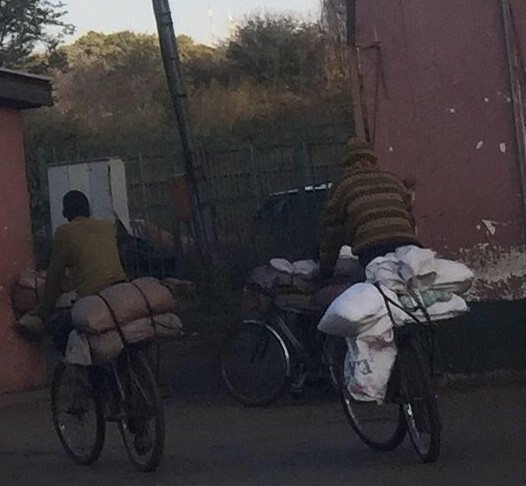 Boys on bikes, women with baskets on their back and top of heads and big trucks loaded with copper navigate their way through the border crossing. The boys and women often make the daily trips. The trucks can be delayed at the border with paperwork for one day and sometimes three days! Patience I imagine in this country is crucial. We saw the bicycle boys both on our way in the afternoon and the next morning very early as we headed to an excursion before sunset. It’s an hour ride from Livingstone to Victoria falls. They were pedaling on the side of the road in the dark. My guess since 5am. If you arrive at customs early you get through quickly. Like traffic back home, you leave later and your in line up city. Whether you are bicycling sacks of rice, lettuce or textiles at 5am from one country to another or heading into your desk job in the city, the choice you make when you rise each morning dictates if your family eats. Good perspective as we all enjoy the holiday long weekend.